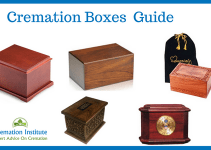 If you’re not sure which cremation urn to choose, this guide is going to save you a lot of time and money! 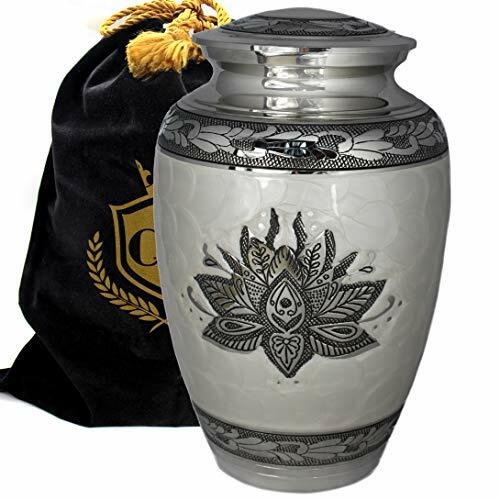 I’ve gone through every cremation urn online and chosen the best- based on quality, design, customer satisfaction, and more. You’ll find every type of urn available- burial, keepsakes, right through to biodegradable urns. Please take your time going through this list and reach out if you got any questions. 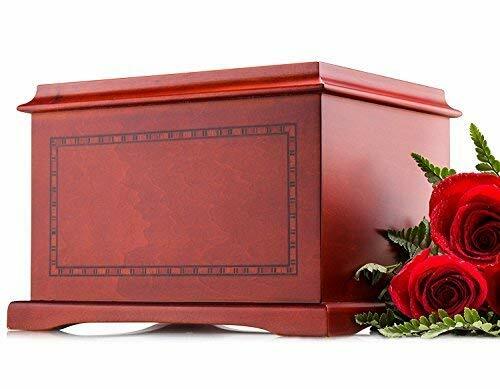 If you’ve have chosen to bury your loved one’s remains after cremation, you’ll need an urn that is sturdy and durable. But it also should reflect the personality of your loved one in some way. 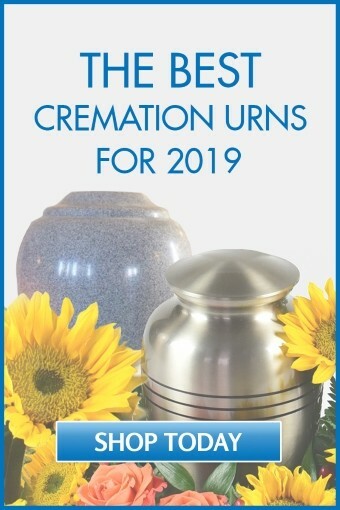 Below you’ll find the most popular burial urns. These urns are also suitable keep at home. 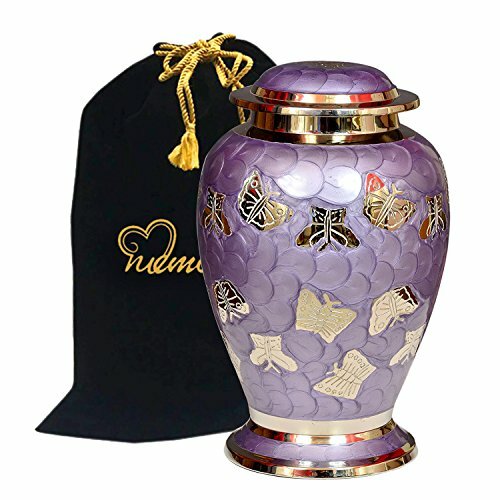 This beautiful and durable urn is handcrafted of solid brass and coated with an elegant lavender enamel finish. It’s sturdy enough that you can display it in your home without any fear that it might easily tip over. A wide mouth makes it easy to put your loved one’s remains inside. Photos can hardly do justice to the beauty of this urn. It holds the remains of adults weighing up to 200 pounds. 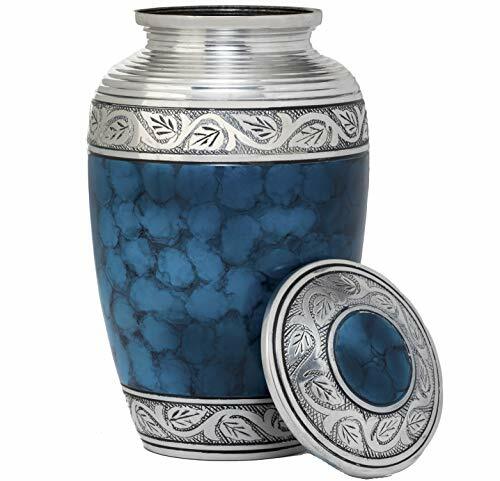 Yet another sturdy but beautiful choice, this urn boasts a warm, vibrant blue shade adorned with silver engraving. The attractive color is equally appropriate to the remains of a male or female. Reviewers appreciate that the threaded lid screws on easily but firmly. A height that is somewhat shorter than other urns opens up new possibilities for display in shelves or niches of your home. Despite this, the urn will still easily hold the remains of a large adult. 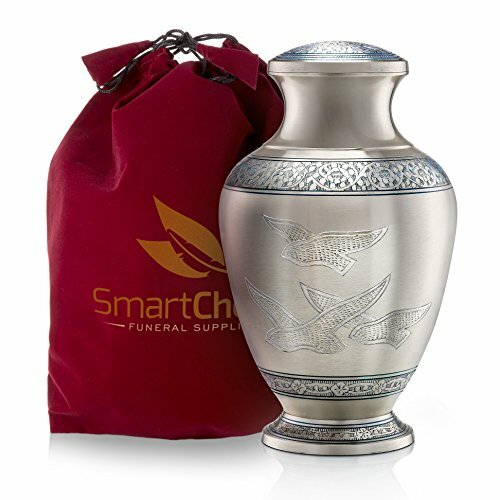 The Smartchoice urn comes with a handy velvet bag for easy storage. But it’s classic and stunning look is great for display, too. It’s more than large enough for the remains of any adult. It comes in a variety of colors, including a classic shade of black, delightfully feminine pink, or smooth, simple white. Crafted in high-quality metal with a royal blue finish, this brass urn is a unique and timeless choice. A polished dove design with delicate leaf borders make it a perfect memorial for a loved one who served in the armed forces. The seller takes special care with the packaging so you don’t have to worry that the urn will become damaged in transit. A glossy crimson and burgundy finish adds a dramatic and eye-catching flair to this solid urn. The Serenity Urn is large enough to fit your loved one but small enough to be tastefully displayed on a shelf or mantle. It can be easily personalized with the help of a local jeweler or engraver. 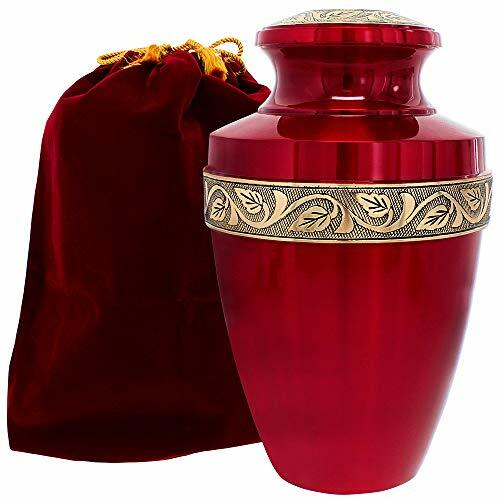 The urn is just as lovely as any that you would find at a funeral home, but costs a fraction of the price. A large urn accompanied by a free matching keepsake urn is an unbeatable deal. You can display an urn in your home, while also distributing small portion to a loved one. The urn comes in a stunning shade of purple impossible to accurately capture in photos. The bold sparkle of these urns make it a great way to memorialize a soul that had its own special shine. The Fedmax urn with delicate details of leaves and flowers make this a gorgeous memorial. It comes with a velvet bag for added elegance and convenience. The urn is tall and stately. Be aware that it may be too tall to fit in some niches. But the beautiful colors and sturdy design will be a fitting addition to any decor, and certainly attract positive comments if displayed during a funeral or memorial service. Another large and affordable choice, the Zeus Sapphire comes in a deep and striking shade of blue. It’s handcrafted of brass. A sturdy felt base makes it easy to display, and a threaded lid gives you a much needed sense of security. 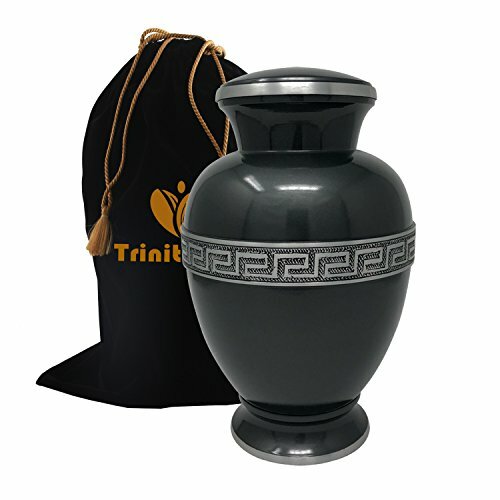 A velvet bag of gun-metal gray adds to the elegance and convenience of this gorgeous urn. It’s large enough to easily fit the remains of most adults weighing up to 200 pounds. This handcrafted brass urn is notable for its stunning Mediterranean blue finish. Besides creating an urn that honors the memory of your loved one, Trupoint is also known for exemplary customer service. 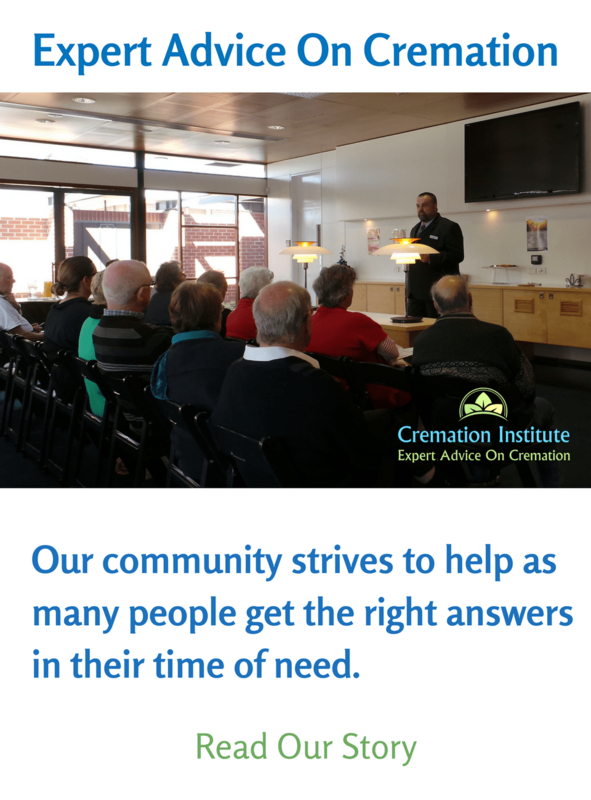 If you have any complaints about your urn, they are committed to fixing the problem, and show a level of compassion that goes above and beyond. The urn travels easily and stands up well to the test of time. Although this urn is smaller than some of the others on the market, it will still fit the remains of a large adult. It’s also easy to display just about anywhere. It comes with a special screw mechanism to ensure a proper seal between the lid and the vase. You can choose from six different (and equally stunning) colors. These include Blue Peace, Purple Silver, and Silver Pearl. 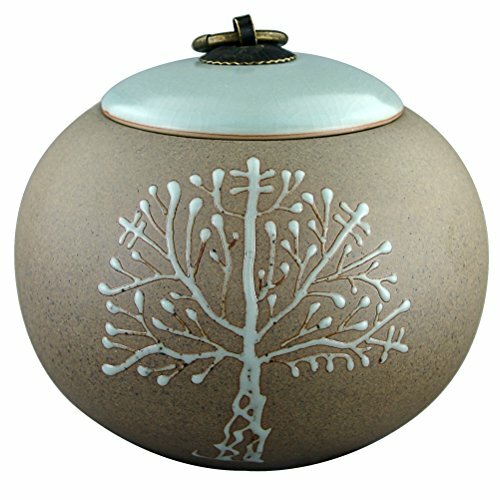 This is a stunning ceramic urn patterned with a delicate and comforting tree of life design. A beautiful lacquer finish makes it look smooth and glossy. It’s a smaller urn, ideal for the remains of pets or of humans weighing up to 50 pounds. You might also consider purchasing several of them to share a loved one’s ashes among different family members. 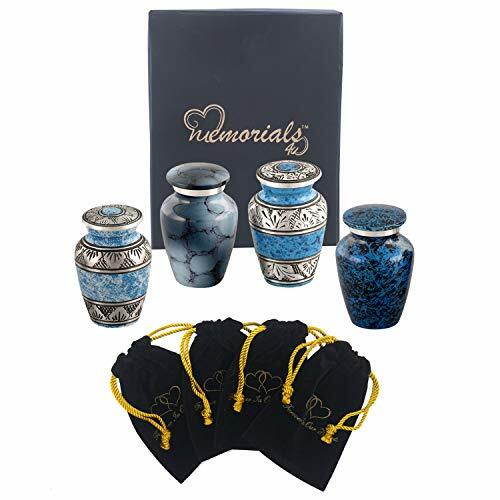 MEILINXU also offers matching keepsake urns, which can be purchased separately. A swirl of warm and peaceful ocean colors makes this urn a comforting remembrance. It’s especially appropriate if your loved one spent many happy hours enjoying the ocean waves. The seller stands behind their products, offering a full refund if the urn fails to satisfy. Each handcrafted urn has a slightly different design, ensuring that yours will be truly unique. The urn comes in a velvet carrying box. 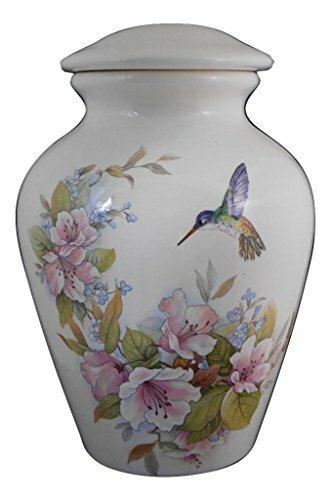 A beautiful ceramic design of pink roses with a visiting hummingbird offers comfort in the peace and simplicity of nature. It’s perfect for a loved one who enjoyed flowers, gardening and/or birdwatching. It’s ideal for a small adult. It’s also well suited to holding the cremains of a beloved pet. This butterfly urn is crafted of brass and decorated with a pattern of beautiful silver butterflies. A lacquer coat in a delicate shade of lavender will keep the urn glossy and brilliant for years to come. The pattern on each urn is unique, so you can be sure that yours is one of a kind. Many traditions see butterflies as symbols of human souls or of resurrection. 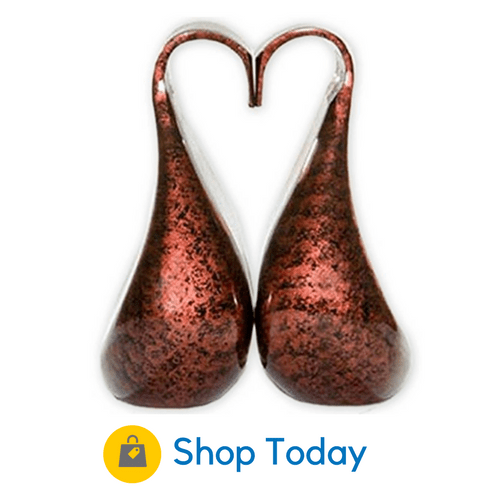 This makes them an ideal decoration for a memorial urn. This stunning urn is finished in glossy mother-of-pearl and gleaming brass. The detail of a graceful brass rose is engraved on the urn, representing a love that’s etched permanently on your heart. A gold cover and a beautiful velvet-lined box for storage add to an overall effect of opulence. 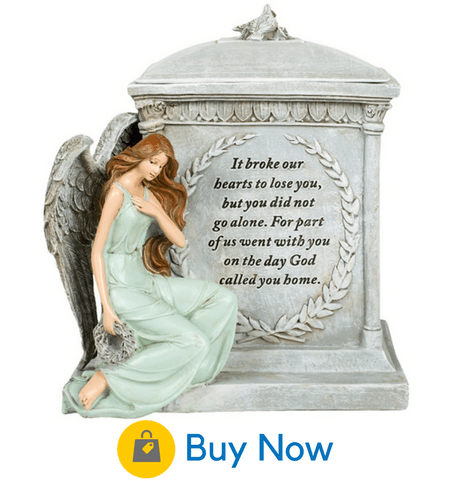 This gorgeous urn is more than worthy of an honored place on your mantel. Most of the urns on our list are easy to personalize by taking them to a professional engraver. But this urn comes with 3 lines of custom engraving included, a welcome convenience at such a difficult time. 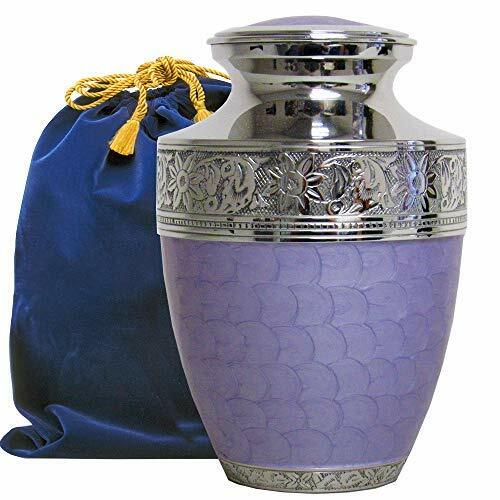 The urn has a smooth glossy purple finish, evoking feelings of luxury and comfort. A gorgeous decoration of flying butterflies symbolizes peace and freedom. Four different sizes are available. An adult urn can hold the remains of a person weighing up to 200 pounds. You can opt for an Extra Large urn for a loved one who weighed up to 400 pounds. A lotus flower is a beautiful Buddhist symbol of purity and detachment. That’s what makes this tranquility urn such a wonderful way to remember your lost loved one. Another very popular type is a cremation box, which can also be used for burial or in the home. Here are some elegant boxes available. This rosewood box holds about 30 cubic inches. A sliding panel on the bottom closes securely but opens without hassle. The intricate tree of life carving makes it a lovely remembrance. This is a plain but high-quality box suitable for the remains of a person weighing up to 170 pounds. It is made of catalpa wood, which is lightweight but very durable. Although slight damage during shipping has been reported by some, it is still a good-quality box for the price. 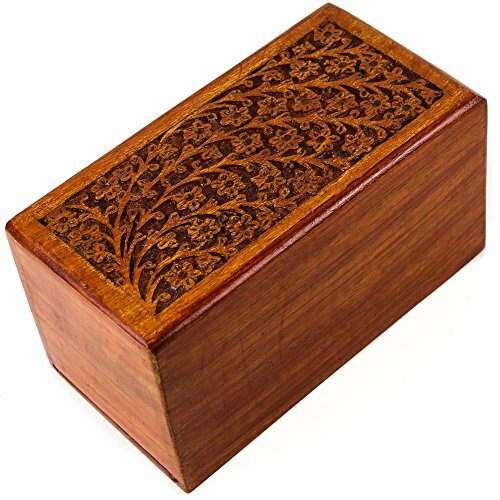 The Chateau wooden box is unique for its glossy burl wood finish. It’s crafted of medium-density fiberboard, and has plenty of space for the remains of a large adult. You can also purchase a matching urn of a smaller size as a keepsake. It’s easy to personalize this box by adding a brass plaque. This is a small and intricately hand-carved box which is a great choice for the remains of a small child or pet. The rich golden brown color gives it a luxurious and elegant look. It closes with a sliding panel and a screw to keep it secure. Discreet and attractive, the box can easily be displayed without even looking like a traditional urn. 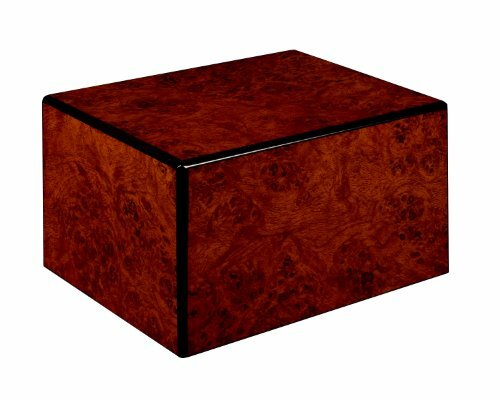 This wooden urn box is crafted of glossy, durable hardwood. A simple but elegant chasing border gives it a little extra touch of class. You can now purchase this urn with a customized engraved brass plaque to make it look even more distinguished. The remains of a large person can fit in this box with ease. The laser-engraved detail of a cowboy riding towards a river lends character to this unique urn. If your loved one enjoyed the freedom of the outdoors, this is a perfect remembrance. Symbolizing the ultimate freedom as your beloved cowboy rides off into the sunset forever. The scene is intricately carved on walnut hardwood. The details are so lifelike that it appears three-dimensional. A lovely tree of life carving shaped like a heart graces this rosewood box perfect for the remains of a pet or to be used as a keepsake urn. The tree of life symbolizes renewal and immortality. It is sure to bring peace to your heart. You can get this box comes in a variety of other beautiful colors and designs, including Antique Pyramidal, Antique V-Shape, and Golden on White. This solid rosewood urn was handcrafted by artisans in India. It holds about 200 cubic inches of remains. 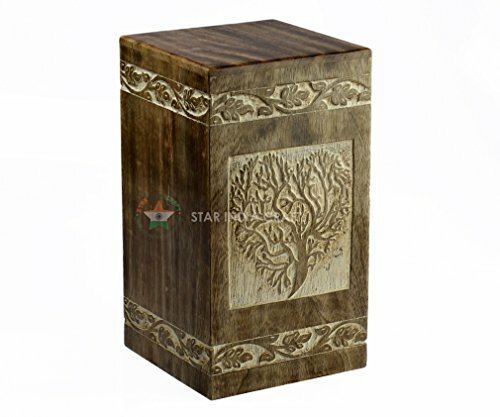 It is a simple box with a delicate hand-carved treetop design. The wood is a beautiful, warm shade. 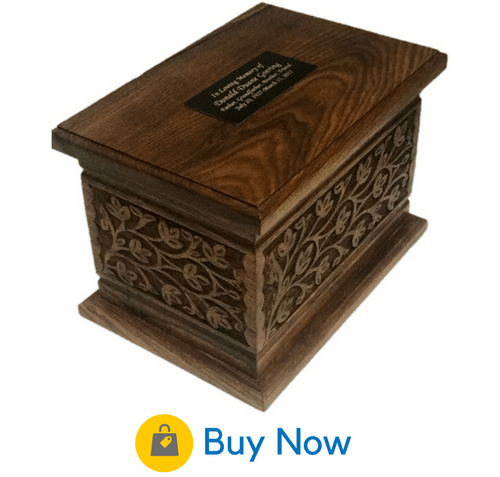 It’s an excellent choice if you want an urn made of high-quality wood. 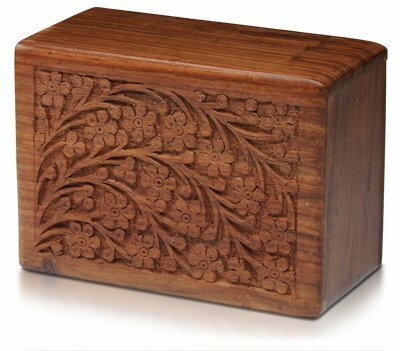 The Memorials4u urn box comes with a delicate hand-carved tree of life design on the top. A customized brass plate is included in the price. An easy sliding panel on the bottom makes the urn easy to access, yet secure. 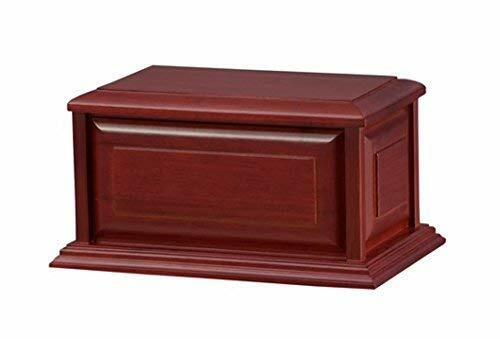 This adult sized urn is carved from 100% alder wood, which resembles the color and texture of mahogany. Four screws in the lid ensure that it seals tightly. The box is simple and plain, yet it exudes quality. It’s perfect to honor a loved one who enjoyed the simple things in life. 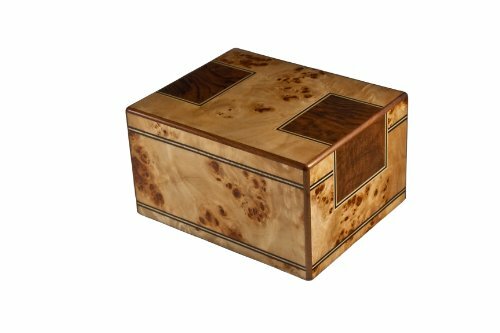 This wooden cremation box combines elements of classic simplicity with luxurious elegance. It’s crafted of soft blond maple with a finish of walnut burl and ebony inlays. This gives it a smooth, glossy, lacquered look. The interior is lined with velvet to enhance the luxurious effect. It’s large enough to place a smaller temporary urn directly inside. A bottom panel is firmly secured with four screws. Small enough to fit in the palm of your hand, a tiny keepsake urn allows you to keep your loved one close to you always. You can use it to keep a small portion of your loved one’s ashes if you have chosen to bury or scatter the remainder. Many people also purchase a set to be share among children, siblings, or friends. 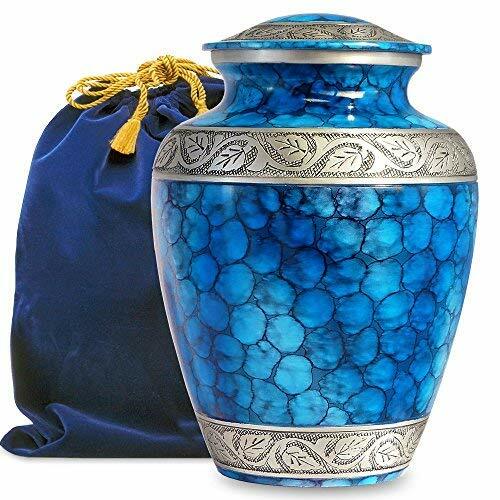 At just 2.25 inches tall and in a comforting shade of deep blue, this is the ideal keepsake urn. 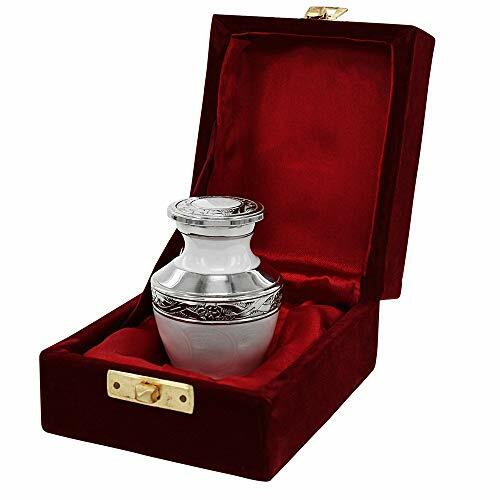 A satin-lined velvet box comes with the urn, giving you a classy and tasteful method to store your memento. At such an affordable price, you can easily order a set of them to share ashes among family members. They are small enough to fit in the palm of your hand and easy to take wherever you go. This includes six beautiful urns, each with a different design. It’s a wonderful way to give each family member their own unique memento of your loved one. Each one is adorned with fine brass and aluminum detailing over a smooth, glossy finish. While every pattern is different, each one is artful and subtly comforting. The urns can each hold about three tablespoons of ash. An elegant, satin-lined carrying case makes it easy for you to transport the urns when travelling. 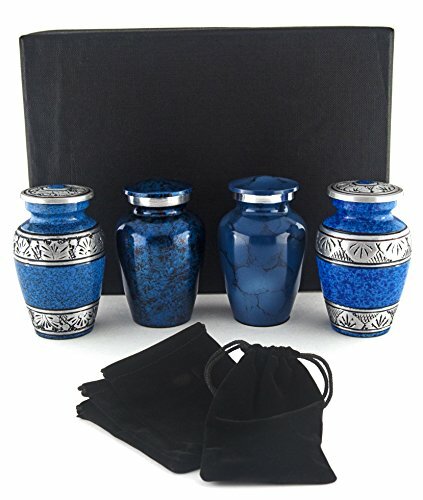 This is a set of four small keepsake urns, crafted in a deep, comforting shade of blue. Though they are equally lovely, each urn is slightly different, allowing you to personalize these keepsakes among family members. The set comes with four individual velvet bags for secure carrying and storage. Each one can hold a small portion of ashes or a lock of hair. As an alternative to display, they can all be kept together in a simple but stylish carrying case. This set of small urns is noteworthy for the exquisite and detailed decoration. 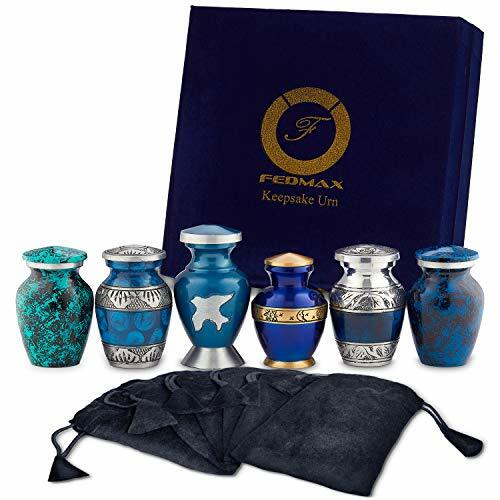 There are also plenty of helpful add-ons included in the package: a display case, four velvet drawstring carrying bags, and a paper funnel for transferring the ashes into the urns. The urns may appear delicate, but they are constructed of sturdy metal. 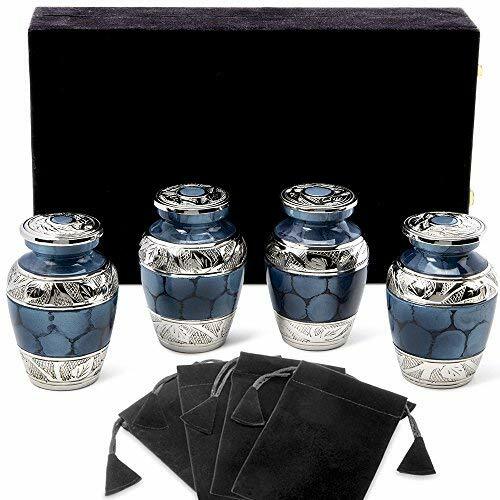 Each urn has a deep blue color with a silver band and four different designs. The urns are carefully crafted by hand. Each one will hold about three tablespoons of ashes. It’s easy to purchase a larger matching urn separately to make a gift of these keepsakes even more meaningful. Another option is to use the urns to keep a small portion of cremains with you following a scattering ceremony. Another small keepsake urn, this one boasts an ethereal shade of pink and a hand-etched design of butterflies. A symbol of beautiful new life after dying in a caterpillar’s cocoon, the design will evoke feelings of comfort and peace. It’s made entirely of brass with a pewter finish. While it is meant as a keepsake, the design and size also make it perfect for the remains of a premature infant. The urn is beautiful enough to be proudly displayed in your home or office. It will look very lovely and comforting placed next to a cherished photo. The smooth white enamel finish on this keepsake urn gives it a classic and timeless look. Delicate swirls on the finish are reminiscent of mother-of-pearl. A screw-top lid offers security, but is still easy to access if you want to store the ashes for a later scattering ceremony. The urn can also be purchased in packs of four as an affordable way to share ashes among friends and family. As a bonus, they come in a beautiful, velvet-lined box with brass clasps. This set of four pewter urns has an understated yet elegant appearance. 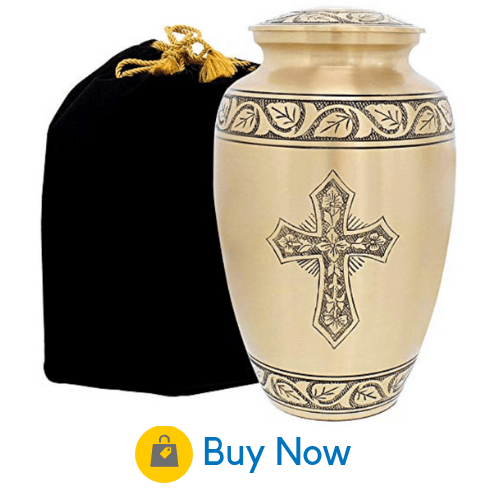 It comes with several paper funnels, greatly simplifying the task of transferring your loved one’s ashes. 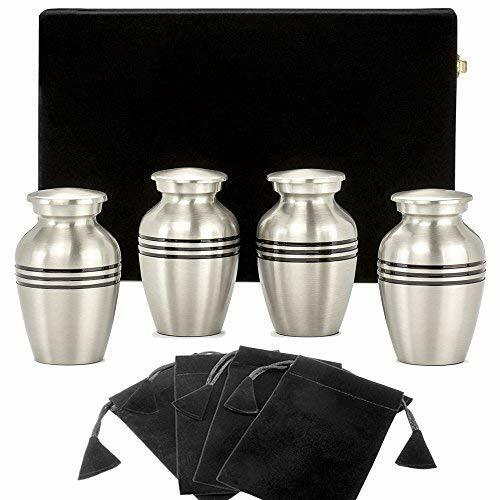 A velvet case gives you a classy and secure place to store the four urns until you are ready to distribute them. The urns are sturdy and easy to transport when travelling. 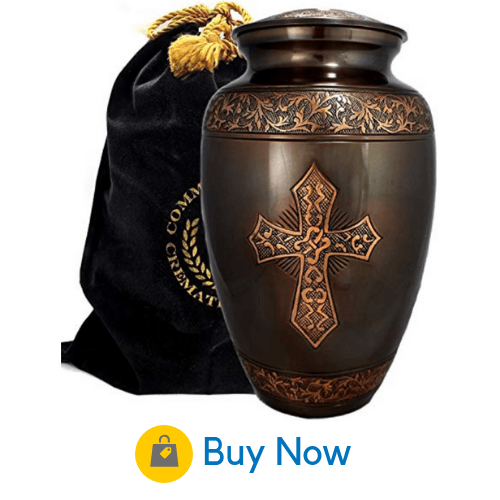 A matching full-size urn is also available from the same seller. They can be easily personalized if you take them to a custom engraver. This is another set of keepsake urns, handmade from brass and decorated with silver engraving. Each urn has a slightly different design, and comes in a different shade of blue. The glossy lacquer finish comes in Summer Blue, Forest Blue, Ocean Blue or Cloud Blue. Though some have reported that one of the four they received was green instead of blue, buyers are still impressed overall with the beauty and quality of the product. The urns are packaged with great care to avoid breakage during shipping. This simple but elegant keepsake urn is ideal to remember a person of faith. It’s made of brass and hand-engraved with a gorgeous black-trimmed Christian cross. A felt bottom allows you to display the urn without scratching furniture surfaces. It’s made of brass and can be purchased in three different colors: Silver, Gold or Brushed Bronze. Matching Large or Extra Large urns are also available for purchase. The Small urn stands about three inches high. 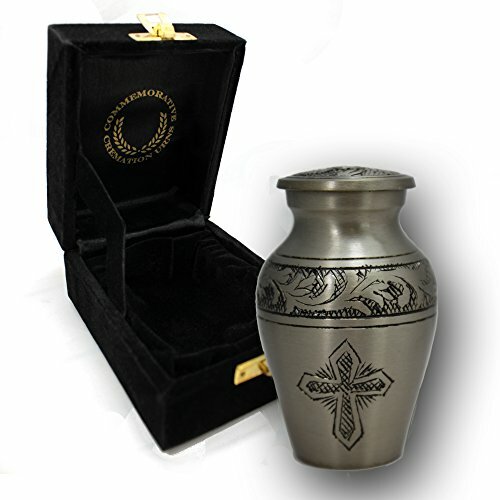 The urn comes with a beautiful velvet-lined box for storage. The threaded lid stays on securely, but is easy to open when you need to. This is a tasteful and attractive jewelry choice which allows men (or women) to wear their loved one’s remains close to their heart. The chain comes in a choice of three different lengths so it can be easily tailored based on your size and taste. The simple bar pendant is minimalist but meaningful. A small and striking rhinestone is embedded at the base of the bar to add just a hint of sparkle. You can place ashes inside, or you may place other small mementoes, such as dried flowers, a lock of hair, or dirt from a special place. The pendant comes in Black, Gold, Rose Gold or Silver. 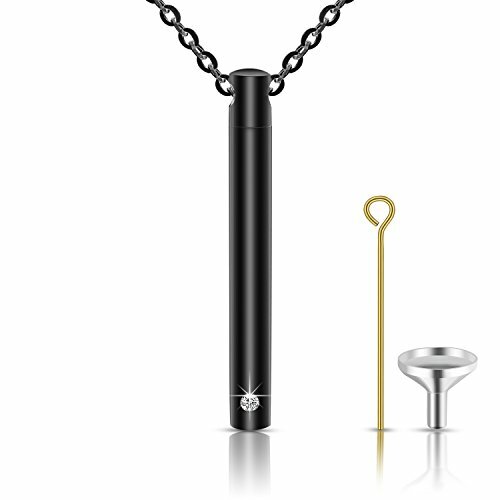 The chain and pendant are made of hypoallergenic stainless steel, guaranteed not to rust. This is a simple but striking urn pendant, consisting of angels’ wings forming a cross. It comes with a 20-inch chain and a fill kit. Other lengths of chain are available. While the pendant is strikingly good quality, some have been less than satisfied with the chain. A convenient gift box is also included. It’s made of rust-proof, waterproof stainless steel crafted in a style that is equally flattering for men and women. You can wear your loved one’s remains close to you every day without worrying that it will break or rust. While black is a popular choice, this necklace comes in a variety of colors, including Silver and Rose Gold. 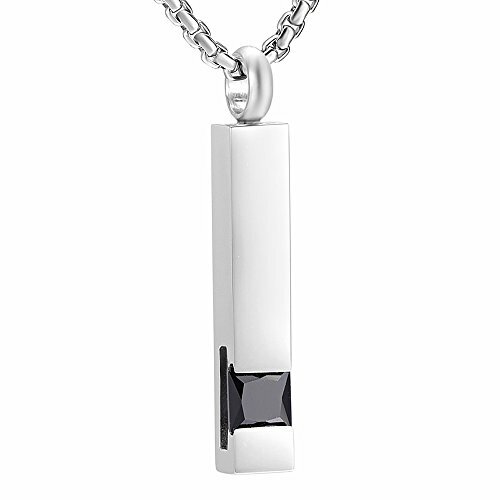 The pendant of this urn necklace is a stainless steel bar embellished with a small, vibrant crystal. You can easily take it to an engraver to have the pendant personalized with your loved one’s name or other relevant details. A selection of crystals means you can choose your loved one’s favorite color. A miniature funnel and pin are included to help you place a small amount of remains inside. The pendant is guaranteed not to irritate your skin. It also won’t tarnish or change color over the years. It comes with a 20-inch chain, as well as an extra extension chain. The colors of the gemstones may be slightly lighter than what is pictured, but are still beautiful. Colors include Dark Blue, Light Blue and Orange. If you want to memorialize a loving couple, having a double urn for them is a wonderful tribute. They offer comfort in the suggestion that your loved ones maintain their strong bond in the afterlife. This walnut companion urn gives an impression of solid simplicity and strong faith. It’s only adornment is an inlaid maple cross covering the top of the urn. 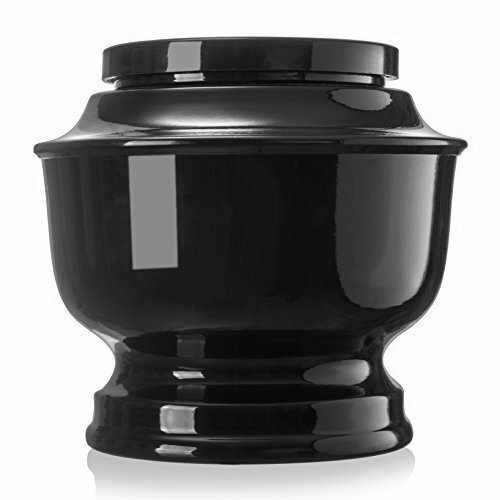 The glossy lacquer finish gives the urn a luxurious look. To place ashes inside, simply unscrew the bottom panel. The urn holds 400 cubic inches of cremains, easily fitting two people. You can place each loved one’s ashes separately, or commingle them. This a set of two graceful brass urns in the shape of swans. When placed side by side, the swans’ arched necks form a heart. A faux bronze finish adds to the elegant and classy effect. This touching and unique design is a wonderful way to memorialize unending love. 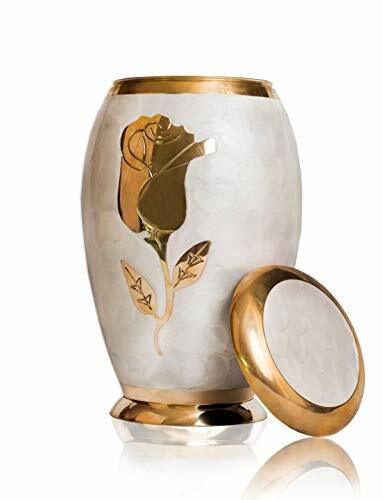 The urn can be displayed as a tasteful piece of art without anyone knowing its real purpose, making this memorial both beautiful and discreet. These sturdy brass companion urns give an impression of understated luxury. They are crafted entirely of brass with a pearl-white nickel finish for a glossy and smooth look. The two urns share a heart-shaped base as a tribute to the bond that your lost loved ones shared. Each urn has an intricate hand-etched design near the top and on the base. 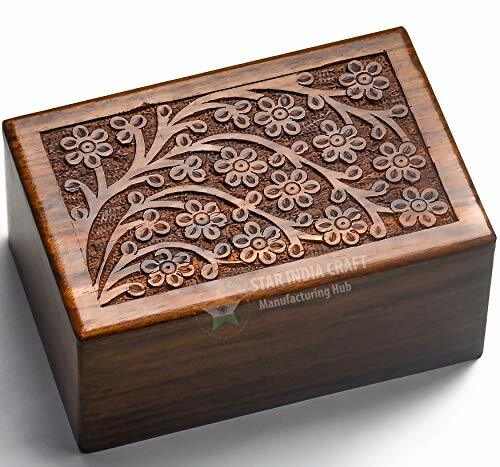 An intricate leaf design graces this solid and classic hardwood box. This Extra Large urn can easily hold the remains of two adults. Two brass name plates are included with the purchase of the urn. Just be sure to remember to choose the option of customizing the urn before checking out. You can place the plates anywhere on the box that you choose. 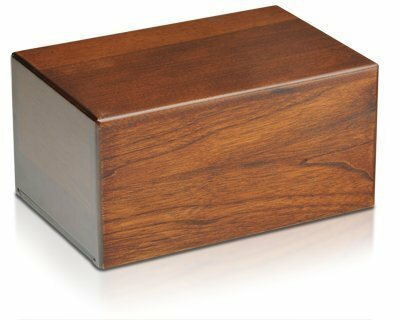 This large walnut box is the ultimate in simplicity and high quality. It’s large enough to fit the remains of two people if they are removed from the boxes that you get from the funeral home. The urn has a capacity of 400 cubic inches. Engraving can be purchased separately. Metal rose artistry adds an extra touch of beauty and elegance. It’s the perfect memorial to honor a couple who enjoyed the finer things of life, like flowers and artistry. Each urn is custom-made for each individual client, making it a highly personal and meaningful keepsake. The comforting stability of a sacred book is decorated with doves, the universal symbol of peace. It’s tough to beat the artistry of this unique companion urn. The book is carved from solid walnut with a lighter area between the covers laser etched to look like pages. The doves are also laser-etched from light colored hardwood. 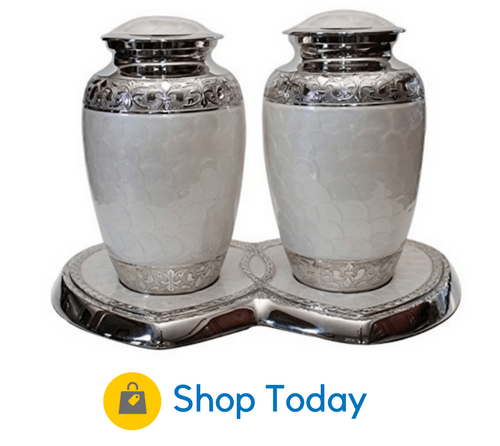 You will feel that your loved ones remain forever close to you with this stunning double urn. An inspirational verse about the closeness of our departed loved ones graces one side of the hardwood box, with space for a photo on the other. 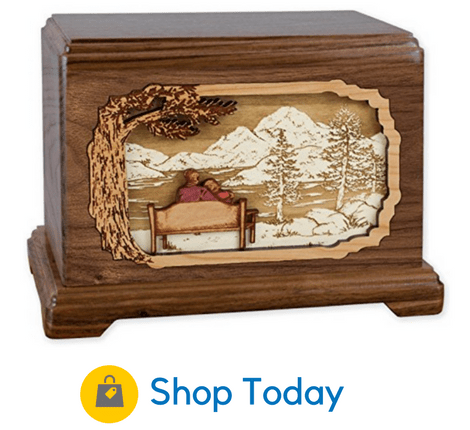 This intricately crafted box is perfect for a couple who enjoyed nature together. The carving depicts a man and woman sitting peacefully together on a bench, enjoying each other’s company as well as the lake and mountain views. It will evoke peaceful thoughts of your loved ones resting peacefully close to each other for eternity. 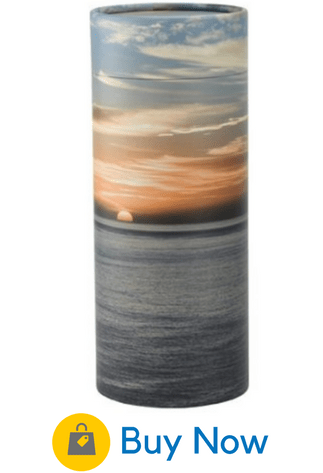 If your loved one loved the sea or nature, biodegradable urn might be an excellent choice. These beautifully designed urns are made not to disrupt the environment in which they’re laid to rest. These urns can be intended for sea scattering, ground burial, or for planting a tree. 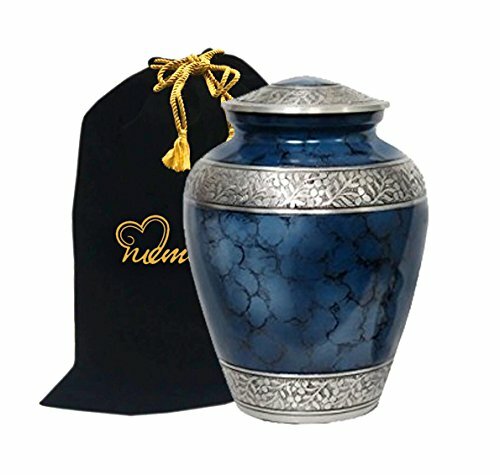 The Journey urn comes in a natural medium blue shade, with a simple yet classy design. When placed in the water, it will float for a few minutes before sinking to the bottom. 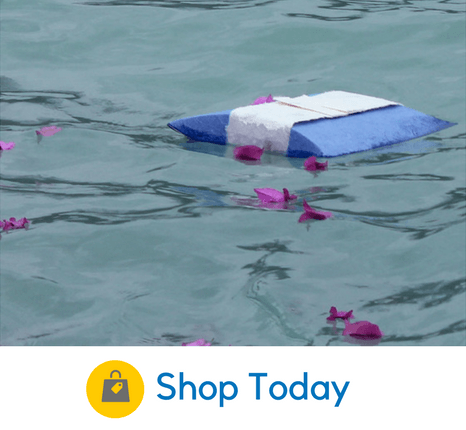 The biodegradable paper material breaks down naturally over time, allowing your loved one’s ashes to become one with the lake or ocean waters. The urn also comes with a water soluble bag for easy placement of the ashes inside. The delicate lily design of this urn makes it the perfect choice for a waterside memorial service. It is a photogenic memorial which gives the natural and beautiful appearance of a flower floating on the water. 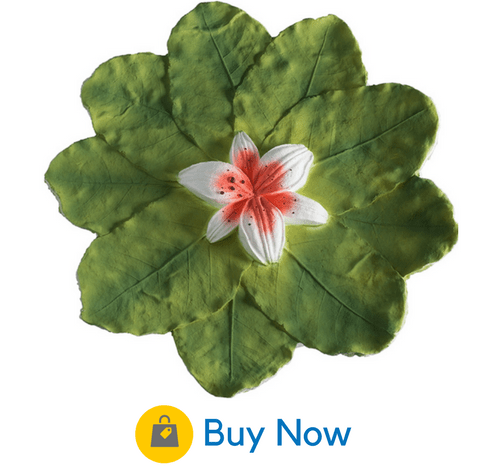 It’s made of biodegradable paper and clay which work well for both water and ground burials. Lilies are often used in funerals because they represent the purity and innocence that is restored to the soul after death. 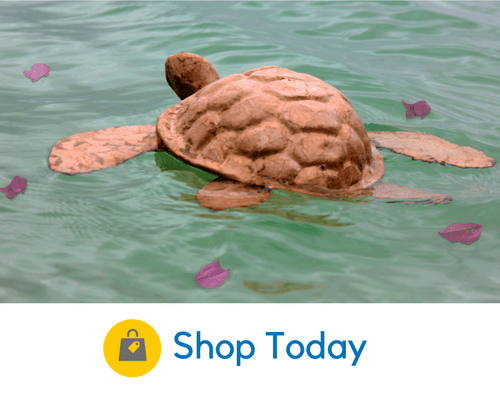 If your loved one had a fondness for wildlife and water creatures, this may be the perfect urn to memorialize him or her. 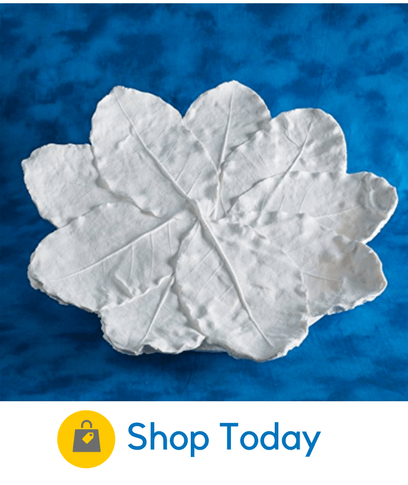 It is crafted of natural paper in Mexico by skilled artisans, and will naturally biodegrade over time. The urn floats on the water for a while before sinking, giving you the chance to say a meaningful seaside or lakeside goodbye. Another natural-looking lily urn, this one is a vivid shade of green to memorialize a true nature lover. You can increase the lily’s float time by giving it a gentle shake to evenly distribute the ashes. Nine leaves are placed around a coral flower to give the 21-inch urn a strikingly life like appearance. The urn is made of clay and cotton, and all paints used on it are biodegradable. This scattering tube gives just the right peaceful and beautiful touch to your scattering ceremony. The tranquil scene of a sunset is painted in soft shades of blue and pink. The tube is eco-friendly. After the ceremony, you can either hold onto it as a keepsake or recycle it. You can easily release the ashes by sliding out the lid and pushing the perforated tab. What could be more comforting than knowing that your loved one’s remains have regenerated a beautiful tree of life? Simply place the ashes in the lower part of this simple urn, plant it, and mix the starter components in the upper capsule, along with additional soil. 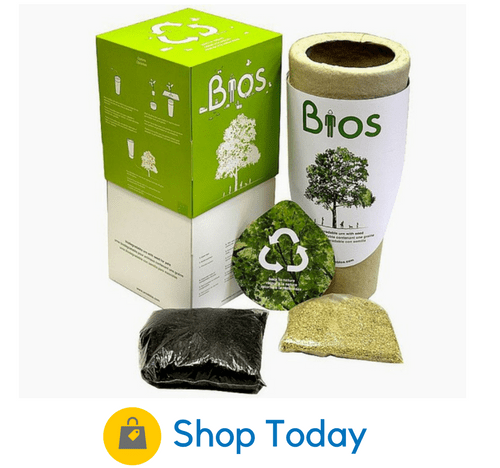 The Bios urn comes with a pine tree seed planted inside, but this can be replaced with the seed of any other kind of plant or tree that you desire. The design on this urn give it a precise resemblance to a lustrous white conch shell resting in the sand. Your loved one’s ashes can be placed inside the water soluble bag and tucked into a bowl which attaches to the bottom of the urn. 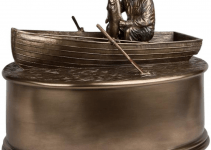 As you watch this touching memorial float and slowly sink on the water, you will feel that you have given your loved one a suitably memorable and photogenic sendoff. Scattering ceremonies or water burials can be incredibly memorable and meaningful. 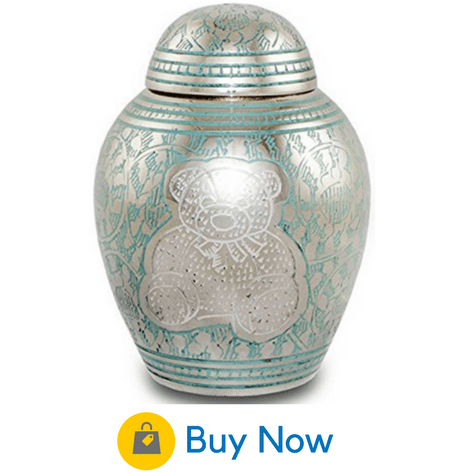 A hand-etched teddy bear, the universal symbol of childhood comfort, graces this lovely urn. It’s nickel plated in blue, with the teddy bear design etched in pink and white. Customized engraving for the base of the urn can be purchased separately. 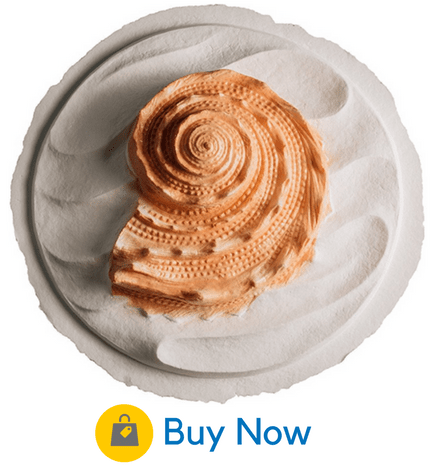 To do this, simply add the engravable base when you make your purchase. The urn has a shiny metallic look, and is built to last. This charming memorial is a real stuffed teddy bear, with a zippered enclosure in the back for holding a small amount of cremains. You can display it in your home and no one will even realize that it’s a cremation urn, as it simply looks like a child’s toy. It comes with a fabric heart for holding the ashes, a very comforting small touch. This baby urn comes in a comforting and peaceful shade of light blue, decorated with subtle swirls. It is the perfect size to hold the ashes of an infant, and can also be used as a keepsake urn to hold a small amount of adult ashes. The lid screws on and off easily, offering security as well as ease of use. This urn comes in a comforting and peaceful shade of light blue, decorated with subtle swirls. 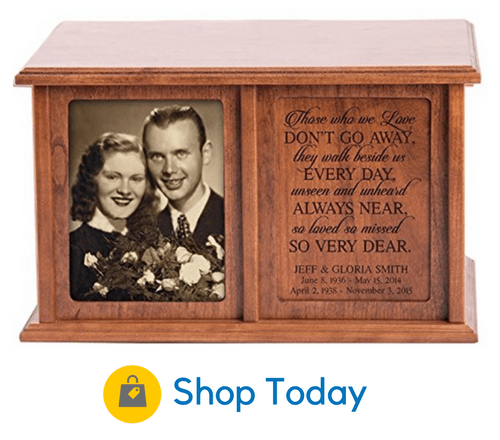 This baby box discreetly holds a small amount of ashes while giving the appearance of a simple picture-frame remembrance. An inspirational quote above your child’s name and dates are tastefully engraved on a box made of cherry wood. A photo can be placed alongside. It can be displayed on your mantle or hung on your wall. The base unscrews with a Phillips head screwdriver to insert the ashes. This keepsake necklace comes with a fill kit and a velvet bag. An 18-inch chain is also included. 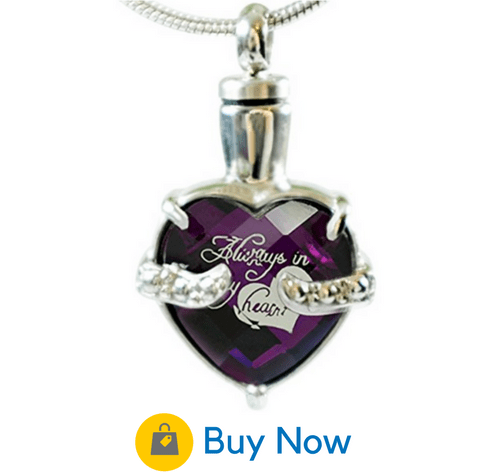 The pendant is delicate colored glass with the words “Always in my heart” laser engraved on the inside. The stunning deep purple shade makes this a beautiful memorial for anyone. 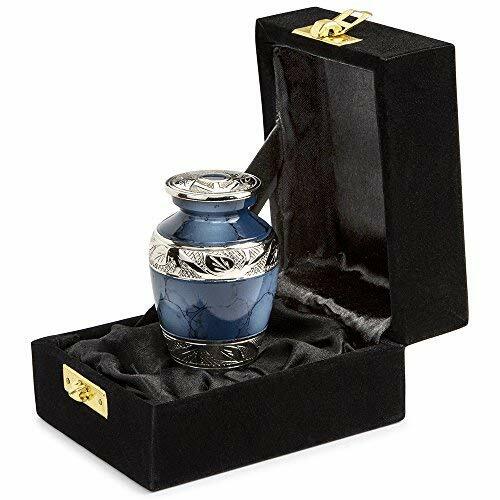 The urn can hold a very small amount of ashes, a lock of hair, or any other small remembrance that you find meaningful. It’s beautiful and tasteful enough to wear close to your heart every day. A white cross urn with an ornately detailed cross lends an extra note of reverence and refinement to any funeral service. 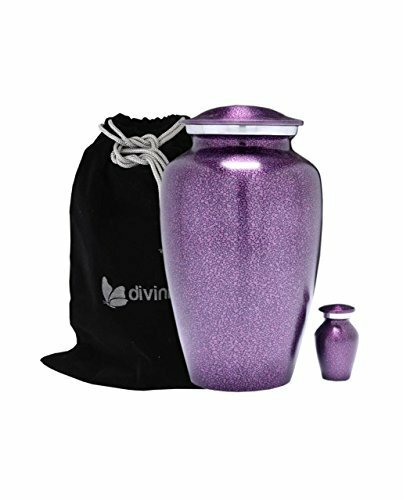 Despite its solid and luxurious appearance, the urn easily costs just half of what you would pay for a similar product from a funeral home. The sturdy brass construction gives the urn a comforting weight and stability. The cross details on this urn are skillfully hand carved in pewter. The design is simple and timeless. It will make your funeral service look classy, without going over the top. A velvet bag makes it easy for you to store or transport cremains in style. Another simple yet ornate urn, this one comes in pewter with a design of a gold cross and detailed gold bands encircling the urn. A glossy lacquer coat adds to the overall impression of elegance. The urn is created by an ancient and unique sand casting process, making it a fitting memento for a very special loved one. This handcrafted and polished urn is another simple yet inspiring choice. The cross design is understated yet beautiful. You can also purchase a small matching keepsake urn, or a set of four of them. The image of a dove surrounded by a brilliantly colorful stained glass window evokes deep feelings of comfort. A dove is a traditional symbol of peace, and also represents the “Holy Spirit” coming upon Christ at the time of his baptism. This large Christ urn is suitable for home display as well burial. The urn is heavy and sturdy, an impression enhanced by the glossy copper finish. It is decorated with a simple black cross and trim. 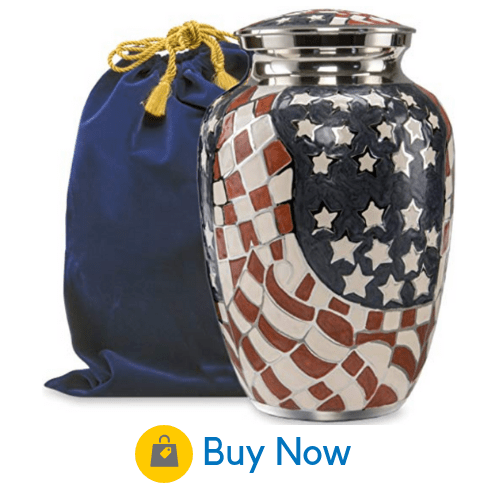 If your loved one’s patriotic spirit was larger than life, this patriot urn is the ideal choice. The entire urn is handpainted with the stars and stripes. It’s very suitable for veterans of any military branch. It can easily fit the remains of an adult weighing up to 200 pounds. This is a large, sturdy, hardwood box with a classic look. It comes with a customized engraved brass plate and an insert large enough to fit a 7” by 5” photo of your choosing. It is the ultimate in dignity and personalization, a send-off you can be proud of. The urn is large enough to fit the remains of an adult weighing up to 250 pounds. This Navy urn offers equal parts of simplicity and dignity. It is a box carved of the finest oak, with a Navy seal emblem medallion included. If your loved one proudly served in the Navy, this urn is the perfect way to honor his/her service. The bottom unscrews to place the ashes inside, and you can place the medallion on the box wherever you choose. For certain personalities, the traditional just won’t do. If your loved one had a strong and unique spirit, you want to remember these qualities in him or her. 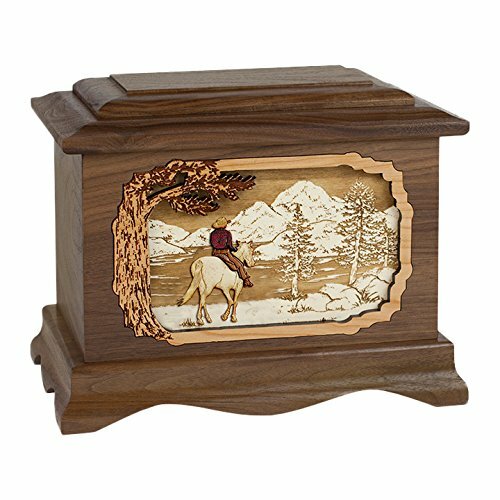 A unique urn celebrates a character trait or a particular interest that made your loved one stand out. A sculpture of a tall Roman-style angel lends a divine sense of regality to this urn. It’s crafted of resin stoneware, and includes an inspirational verse, surrounded by a garland of delicately-carved leaves. The lid does not shut tightly, but you can easily remedy that with a good sealer. You are sure to find it a reminder that your loved one is always close to you in your heart. 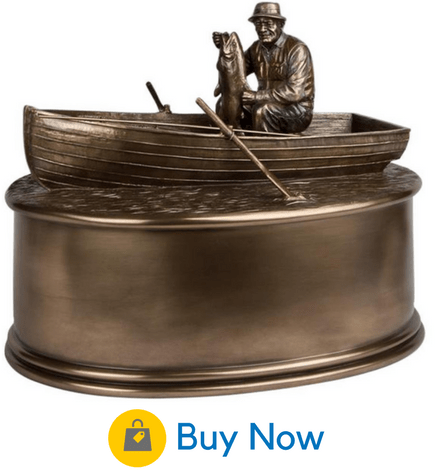 This cold cast resin sculpted urn will allow you to imagine your loved one out peacefully fishing in a rowboat, an image that’s sure to bring comfort. The sculpture sits on a base, and the bottom panel opens for easy placement of cremains. For some people, football is more than a sport- it’s a way of life. 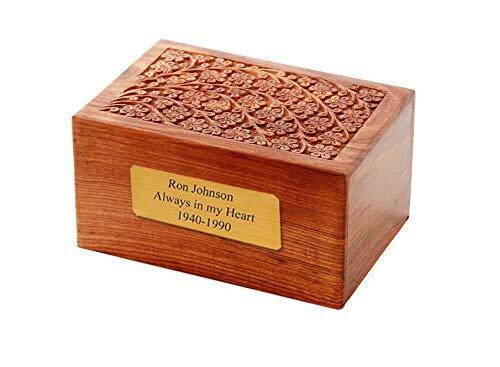 For that person, this detailed wooden urn is the perfect memorial. A three-dimensional plaque on the urn displays a carving of a football player, with a plate for personalization. Engraving is included at no extra charge. 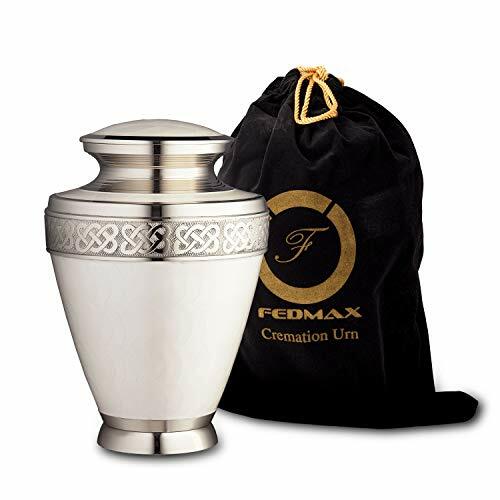 The urn can easily fit the cremains of a large adult. 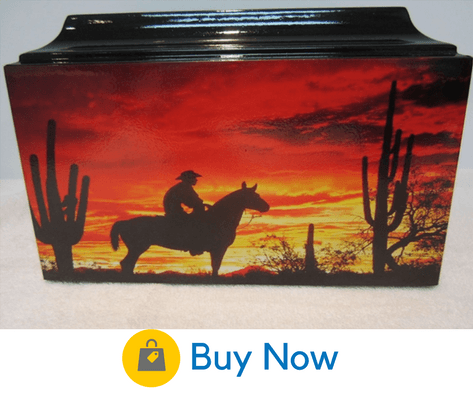 The vinyl artwork on this urn pictures a cowboy on a horse contemplating a desert at sunset. The symbolism evokes an image of your own beloved cowboy riding off into the sunset adventure of his new life. The urn can fit large adults weighing up to 260 pounds. It has one of the largest openings you’ll find on any urn, making the placement of ashes a breeze. 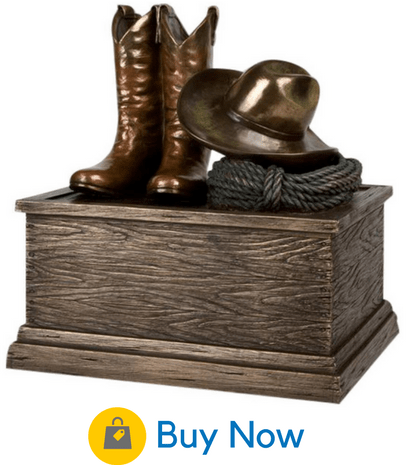 A cold cast resin sculpture of a cowboy hat and boots next to a coiled-up lasso tops this unique urn. It will help you to visualize your loved one laying down his/her hat and boots to enjoy a well-deserved rest. A bottom panel attaches with screws for placement of the ashes and secure closure. 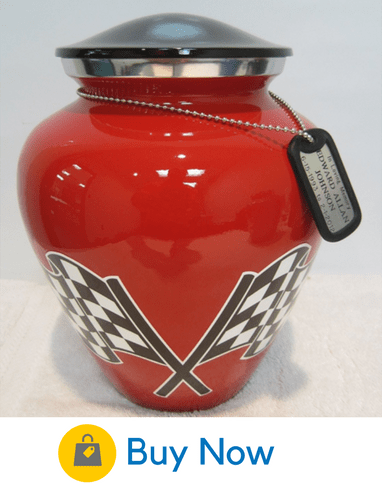 If watching a good old-fashioned car race was something your loved one adored, you can find no more appropriate memorial than this urn. It boasts a glossy red finish, decorated with vinyl artwork that depicts two checkered flags. It’s made of cast aluminum, and can fit the ashes of an adult weighing up to 220 pounds. Though it feels deceptively lightweight, the urn is sturdy and stable. 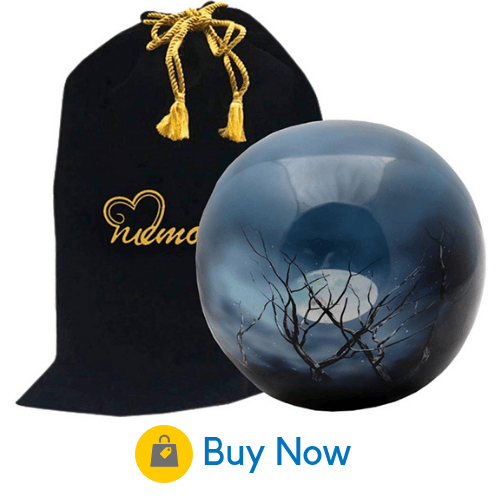 This spherical urn holds a lifelike representation of the midnight sky, perfect for the remains of your favorite moon-loving night owl. It is diamond engraved and constructed with the ancient process of sand casting. One perk is that the urn truly doesn’t look like an urn at all, but rather a unique and beautiful decoration. It’s best to display the urn on a high shelf to show the picture to its full advantage. This is an excellent memorial for the beloved golfer in your life. A detailed sculpture of a bag of golf clubs tops the urn. Personalized engraving is included in the price. Only pet-owners can understand how much this member of your family meant to you. Their loss has left behind a huge hole in your life and in your heart. And they will have a place in your heart for eternity. A pet urn is a wonderful way to demonstrate that. 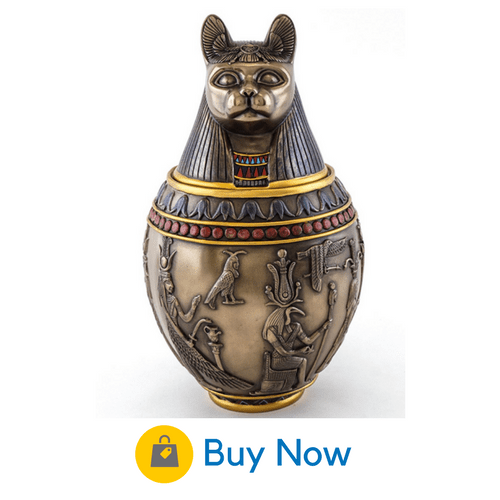 This pet urn is made of solid brass with an attractive pewter finish. In a touch of charming whimsy, double pawprints of gold grace the top of the urn. The small urn can comfortably hold the remains of a pet weighing up to 25 pounds at the time of cremation. 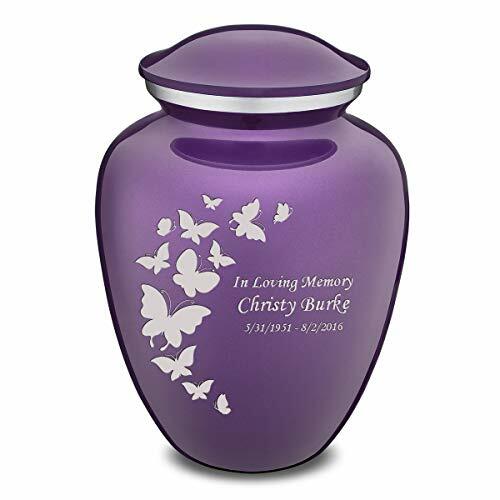 You also have the option of purchasing a medium urn, or a small one with custom engraving. 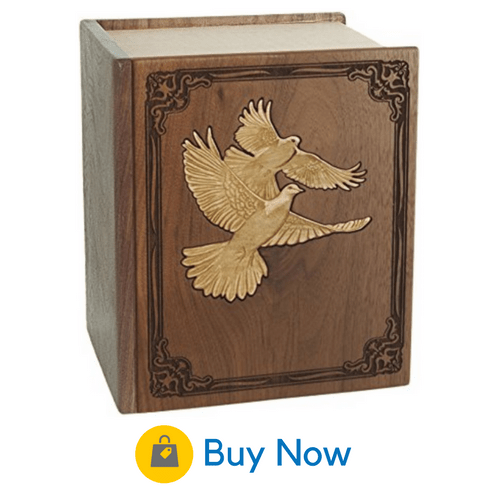 This charming urn box can be displayed with pride anywhere in your home. 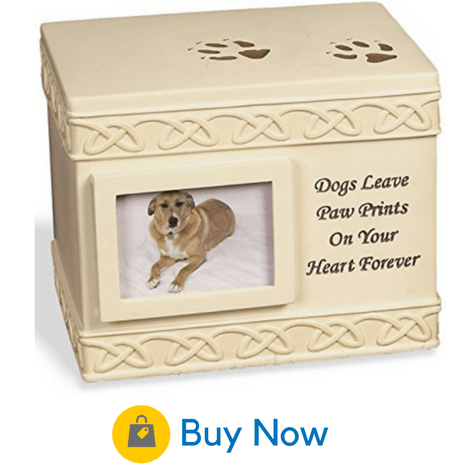 The words “Dogs Leave PawPrints on Your Heart Forever” are carved into the urn, with space next to it for a small photo. Despite its modest 5-inch dimensions, you can easily fit the remains of a large pet weighing up to 100 pounds. It is available in Black, Light Brown or Dark Brown. For a more traditional option, the Near & Dear urn comes in a conventional vase shape. The small size is perfect for the remains of pets weighing 15 pounds or less. The urn has a glossy black lacquer finish and fine brass details. At just 6 inches tall, the urn fits in the palm of your hand and can be easily and discreetly displayed. This memorial is carved from cold cast bronze with ornate details that evoke the ancient Egyptian practice of cat worship. It’s designed to look like the sacred Bastet cat goddess. She is a symbol of protection, as well as the goddess of music and sunrise. You will feel that you’ve given your lost feline a truly royal send-off. The lid can easily be sealed with glue or adhesive. Hand-carved pawprints adorn this solid brass urn. It’s also engravable, so you can easily personalize it with details about your pet. The paws urn is suitable for pets weighing up to 30 pounds. A larger size is also available, as well as a variety of colors and styles. The urn has a heavy feel to it, helping you feel secure that it won’t be easily tipped or knocked over. The bronze sculpture on this urn gives you a peaceful vision of your beloved dog as an angel curled up sleeping in a cozy basket for eternity. The sculpture is crafted of cold cast resin and polished by hand. The urn can fit the ashes of a small to medium dog, up to about 30 pounds. 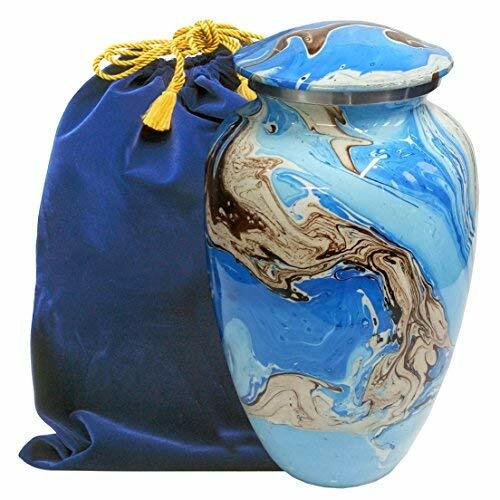 When purchasing a cremation urn online, you may be nervous that it might not be the right size. After all, you don’t want to pay for more urn than you really need. But you also don’t want to face the terrible situation of not being able to fit all the ashes inside. When calculating the size of the urn you need, a good rule to keep in mind is that one pound of body weight equals one cubic inch of remains. By that logic, a man who weighed 170 pounds needs an urn that holds 170 cubic inches. It’s a tough question to answer because there’s so many types of cremation urns available. But generally, expect to pay between $50-$500, with the average price being around $100. The size of the urn, material, design, and material are all factors that will influence the price. My son was a personal trainer in health and fitness. I can’t find any urn that would be fitting. Hi Carmen, I haven’t come across any urns specifically related to health and fitness. Did your son like football, basketball, or baseball? If so, you can find some football urns, basketball urns, or baseball urns here.